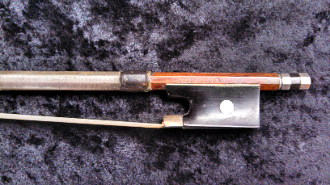 This unusual full size violin bow for sale is a silver mounted Paul Loudon bow. A Loudon bow was last seen on auction in 2004, so it is quite rare indeed. It has a very lovely tip and silver winding grip. The stick is round pernambuco; it is very straight and strong. The Loudon Violin Bow is in very good condition but it can be a bit lively. For $2250.00, this Paul Loudon a very lively bow, so it might be better suited to a collector than a serious professional.